There's something spooky about the rise of the app store. It's like some richly decorated room in an old mansion. It looks fantastic and offers a wealth of original features. But something just doesn't feel right. There's a whiff of some damp spirit hovering in the corner, or behind the faux chestnut panelling. And yet, from the one in your mobile or behind a browser tab, to their rise in desktop computing, app stores are now hiding everywhere. I could never have guessed how successful they would become, and I suspect, neither could Apple - at least initially. They seem to go against the grain of why many of us use technology - we want to bend it to our will, not to what someone else thinks we'd like. But for Apple, the creation of its app store must have seemed the easiest and most obvious solution for its walled garden of iOS devices. It couldn't let people install applications freely, and when it finally decided to let developers create their own applications, it wanted to control the portal to keep control of the device. It can't have been planned, like Microsoft's capitalisation of the burgeoning IBM PC clone market, but through necessity, the stars were aligned and the definitive app store was created. Forget the freedom to install anything from anywhere, or the ability for anyone to publish anything they want. What users seem to prefer is ease of use, simple updates and value for money. I'm not surprised. Despite my reservations, there's something very intuitive about the idea of an app store, and I find myself looking for reasons for why their ascension didn't happen sooner. This is especially true in the world of Linux, which has had a very close approximation to an app store for more than a decade. This is the package manager - a portal to a world of free software, full of new applications, tools, wallpapers and sounds. It has the potential to succeed as one, and ticks many of the same criteria as Apple's alternative, but you don't feel the same love when you choose to launch one. The problem is that package managers appeared not through convenience to the user, but convenience for the distribution. It's a logistical solution for software. A Linux distribution is such a clutter of dependencies, locations and version numbers that a package manager is required to keep all these elements in balance. Without one, you'd have to either install statically linked packages or run the minefield of a manual installation - a process best described as the polar opposite to downloading an executable and running it. Until relatively recently, Linux package managers could never have been considered app stores in the same way as Apple's or Google's. Few allowed you to browse by popularity or discover applications similar to the ones you'd already installed. Nor do they present their bounty with any particular finesse. This has been a missed opportunity. If you're lucky, a search for 'Firefox' will reveal the tool you're after and the package to install, but you may just as easily end up with a list of extensions, libraries or developer files. This isn't the fault of the package manager developers - it's in the remit of many Linux solutions to be perfunctory rather than perfect. They'd rather things were possible than impossible, even if that means only a basic interface. Apple would rather keep things impossible if they can't be done properly. But things are changing. The community Mint distribution has made big steps towards improving the download experience with its package manager, and Ubuntu is also taking the challenge seriously. 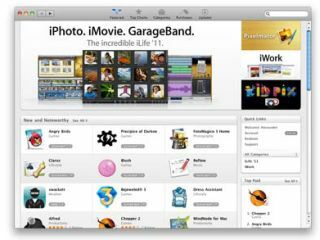 Its Software Center offers a decent selection of paid-for apps, plus an array of free software. But it's the next version, 5.0, that's shaping up to be revolutionary. If it delivers on some of the promises hinted at in early prototypes, it will be one of the major reasons for using Ubuntu again. That spooky feeling must have something to do with app stores losing the spirit of adventure that used to come with tracking down applications and installing them yourself. If all we're ever going to do in the future is click to download pre-approved binaries, there's going to be little old-school fun. Of course, those apps should work a lot better and be easier to maintain, but that's unlikely to help part-time developers who simply want to share their idea. I think free software needs a better solution than yet another app store. It needs an open, portable and widely adopted framework that rethinks software delivery without a gatekeeper. Only then will the spirit of adventure be maintained and that pesky spirit in the corner exorcised.